Long Beach, Calif. – August 2, 2017 – The Black Magic Formula DRIFT Championship presented by BlackVue Dash Cameras will conclude the 2017 Pro Championship season on October 13-14 at Irwindale Speedway. Tickets are now on-sale and can be purchased online via the Formula DRIFT website, www.formulad.com/schedule. The final event of the season never fails to disappoint with drivers putting it all on the line for their chance to complete their season on top of the podium on a high-note. The high-energy and exciting competition at Irwindale Speedway is one of the largest drifting events in the world and will feature world-class drivers, fan midway featuring over 60 companies on display, the AutoCon car show, and the crowning of a champion. 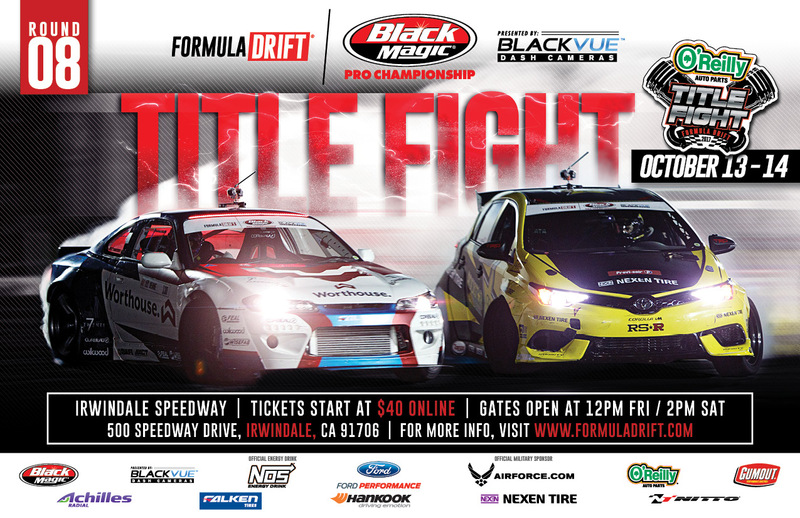 Tickets are now available for Round 8: Title Fight, including reserved seating, 2-day ticket packages, and VIP tickets and can be purchased through www.formulad.com. Ticket prices start at $40 online with all seats reserved for Saturday’s competition day. VIP experiences are also available for purchase including reserved seating, front of the line autograph pass, and VIP track walk. For more information visit, www.formulad.com and find Formula DRIFT on Instagram @formulad, Facebook www.facebook.com/formuladrift, Twitter @FormulaDrift, and Snapchat – formula_drift. Tune into Formula DRIFT on CBS Sports and check your local listings for airtimes and on the Formula DRIFT Livestream. Long Beach, Calif. – October 8, 2011 – Formula DRIFT returned to the Toyota Speedway at Irwindale for the final event of the 2011 season. 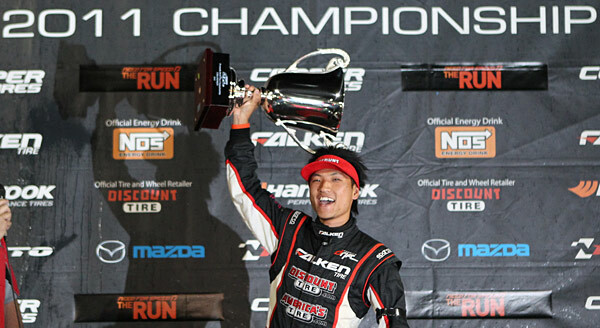 Daijiro Yoshihara in the America’s Tire / Falken Tire Nissan S13 won the championship, while Tyler McQuarrie in the Falken Tire Nissan 350Z took the event victory. Round 7: Title Fight concluded the most successful season in Formula DRIFT history. The sold out crowd eclipsed attendance records for the Toyota Speedway at Irwindale and is now the largest Formula DRIFT event in history. With the championship decided in the Final 4 competition, the event was far from over. Chris Forsberg in the NOS Energy Drink / Hankook Nissan 370Z defeated Darren McNamara in the consolation round to secure third place for the event and also move him up into third place overall. The final battle of the evening pitted Rhys Millen in the Redbull / Hankook Hyundai Genesis Coupe against Tyler McQuarrie. After an intense battle McQuarrie took the victory moving himself up to finish in the fifth standing position for the season. The results of the event could only be described as the ultimate finish to crown a champion. 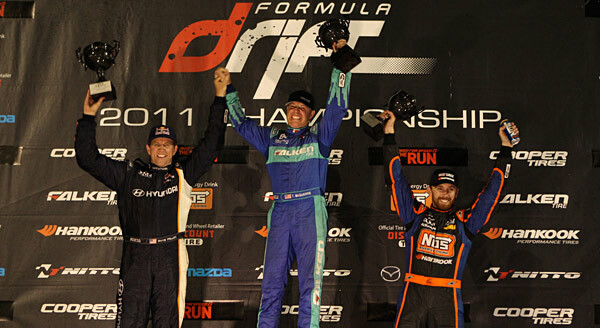 This event was the closest and most competitive chase for the championship in Formula DRIFT history, with 5 drivers entering with a chance at the title. Rookie of the year honors went to Aurimas “Odi” Bakchis. Many scenarios played out with such a close gap in the point standings. Daijiro Yoshihara entered with the point lead and was taken out early in the Top 16 opening the door for the others to take the championship. Yet, the stars were aligned for Yoshihara and by a narrow margin he was able to hold onto the lead to win the 2011 Formula DRIFT Championship along with the Tires.com Triple Crown. Marking the first time in Series history that the champion also wins the bonus prize.